My first job is to work with you over an initial visit to build a client brief. We can discuss together how you would like your garden to improve and ways of achieving this, considering existing plants, garden conditions and budget. I prune shrubs and trees to maintain their natural habit and prolong their life, removing cluttered and crossing branches to open their centres, allowing the flow of air through the shrub to help prevent disease and to encourage new shoots and prolific flowering. Pruning at the correct time is essential and it is important to know the different pruning groups to ensure that each shrub reaches peak performance. 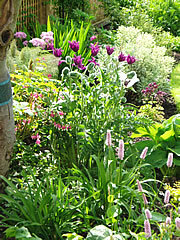 Perennials are the mainstay of many beds and borders, their huge range providing colour through most of the year . However, without proper planning and consideration for garden conditions it is easy to waste moneyon plants that will fail to thrive. I can check and improve your soil, re-position plants in the garden and recommend new plants for your existing garden conditions. I can also divide existing mature perennials to extend their lives, keep them healthy and increase the number of plants in your garden whilst saving you money. I firmly believe that nutrient rich and well structured soil is essential for plant health and sadly this is frequently neglected. The soil should contain all that is needed for plants to grow (with very occasional help). The healthier the soil the more nutrients a plant can soak up, the better the root system develops and the longer the plant lives with improved growth and flowering. Healthy plants can only develop from healthy soil so achieving this is one of the most important jobs I have. Fungal and bacterial diseases and pests can mostly be prevented through correct planting, feeding and ongoing maintenance. Sometimes this is not enough and I then use an integrated approach to pest and disease management, working with you to assess how much damage is acceptable and when cultural, biological and, as a last resort, chemical controls should be introduced. 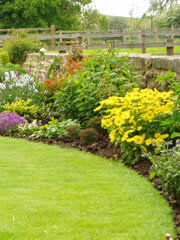 Mulching helps keep weeds at bay and protects plants when applied properly. We supply affordable, decorative and locally sourced mulches from well rotted wood/bark, spent hops, straw, gravel or sterilised garden compost depending on the needs of you, your soil and your plants. Planning a new bed or border. I can help with your planting plan, recommend suitable plants and layout for your garden and advise on any elements you may have overlooked. 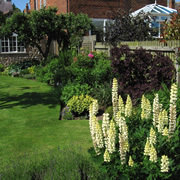 I can also help you design and source any summer planting. I am happy to consult on individual problems.